A car bomb, lorry bomb, or truck bomb, also known as a vehicle-borne improvised explosive device (VBIED), is an improvised explosive device placed inside a car or other vehicle and detonated. Car bombs can be roughly divided into two main categories; those used primarily to kill the occupants of the vehicle (often as an assassination); and those used as a means to kill, injure or damage people and buildings outside the vehicle. The latter type may be either parked (the vehicle disguising the bomb and allowing the bomber to get away), or the vehicle might be used to deliver the bomb (often as part of a suicide bombing). It is commonly used as a weapon of terrorism or guerrilla warfare to kill people near the blast site or to damage buildings or other property. Car bombs act as their own delivery mechanisms and can carry a relatively large amount of explosives without attracting suspicion; in larger vehicles and trucks, weights of around 7,000 pounds (3,200 kg) or more have been used, for example, in the Oklahoma City bombing. Car bombs are activated in a variety of ways, including opening the vehicle's doors, starting the engine, depressing the accelerator or brake pedals or simply lighting a fuse or setting a timing device. The gasoline in the vehicle's fuel tank may make the explosion of the bomb more powerful by dispersing and igniting the fuel. Defending against a car bomb involves keeping vehicles at a distance from vulnerable targets by using roadblocks and checkpoints, Jersey barriers, concrete blocks or bollards, metal barriers, or by hardening buildings to withstand an explosion. Since the height of the Provisional Irish Republican Army (PIRA) campaign in 1991, the entrance to Downing Street has been closed, preventing the general public from getting near Number 10. Where major public roads pass near buildings, road closures may be the only option (thus, for instance, in Washington, D.C. the portion of Pennsylvania Avenue immediately in front of the White House is closed to traffic). Historically these tactics have encouraged potential bombers to target "soft" or unprotected targets, such as markets. In the Syrian Civil War, and Iraq, the car bomb concept was modified so that it could be driven and detonated by a driver, but armoured to withstand incoming fire. The vehicle would be driven to its target area, in a similar fashion to a kamikaze plane of WW2. These were known by the acronym SVBIED (from Suicide Vehicle Borne Improvised Explosive Device) or VBIEDs. This saw generally civilian cars with armour plating added, that would protect the car for as long as possible, so that it could reach its intended target. Cars were sometimes driven into enemy troop areas, or into incoming enemy columns. Most often, the SVIEDs were used by ISIS against Government forces, but also used by Syrian rebels (FSA and allied militias) against government troops. The vehicles became more sophisticated as time went, with armour plating on the vehicle, protected vision slits, armour plating over the wheels so they would withstand being shot at, and also in some cases, additional metal grating over the front of the vehicle designed to activate rocket propelled grenades before hitting the actual surface of the vehicle. In some cases trucks were also used, as well as cars. They were sometimes used to start an assault. Generally the vehicles had a large space that would contain very heavy explosives. In some cases, animal drawn carts with improvised explosive devices (ADCBIED) have been used, generally either mules or horses. Tactically, a single vehicle may be used, or an initial "breakthrough" vehicle, then followed by another vehicle. While many car bombs are disguised as ordinary vehicles, some that are used against military forces have improvised vehicle armour attached to prevent the driver from being shot when attacking a fortified outpost. Mass-casualty car bombing, and especially suicide car bombing, is currently a predominantly Middle Eastern phenomenon. The tactic was first introduced to the region by the Zionist paramilitary organization Lehi, who used it extensively against Palestinian and British military targets; it was subsequently taken up by Palestinian bombers as well. The tactic was widely used in the Lebanese Civil War by the Islamic fundamentalist group Hezbollah. 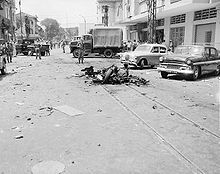 A notable suicide car bombing was the 1983 Beirut barracks bombing, when two simultaneous attacks killed 241 U.S. Marines and 58 French military personnel. The perpetrator of these attacks has never been positively confirmed. In the Lebanese Civil War, an estimated 3,641 car bombs were detonated. While not an adaptation of a vehicle meant to carry people, the WW2 German Goliath remote control tank, has many parallels with a VBIED. It approached a target (often another tank) at some speed, and then exploded, destroying itself and the target. It was armoured so that it couldn't be destroyed en route. However, it wasn't driven by a person, it was instead operated by remote control, by German infantry, from a safe distance. It was effectively, an armoured suicide drone. Car bombs and detonators function in a diverse manner of ways and there are numerous variables in the operation and placement of the bomb within the vehicle. Earlier and less advanced car bombs were often wired to the car's ignition system, but this practice is now considered more laborious and less effective than other more recent methods, as it required a greater amount of work for a system that could often be quite easily defused. While it is more common nowadays for car bombs to be fixed magnetically to the underside of the car, underneath the passenger or driver's seat, or inside of the mudguard, detonators triggered by the opening of the vehicle door or by pressure applied to the brakes or accelerating pedals are also used. Bombs operating by the former method of fixation to the underside of the car more often than not make use of a device called a tilt fuse. A small tube made of glass or plastic, the tilt fuse is not dissimilar to a mercury switch or medical tablet tube. One end of the fuse will be filled with mercury, while the other open end is wired with the ends of an open circuit to an electrical firing system. Naturally, when the tilt fuse moves or is jerked, the supply of mercury will flow to the top of the tube and close the circuit. Thus, as the vehicle goes through the regular bumping and dipping that comes with driving over a terrain, the circuit is completed and the bomb or explosive is allowed to function. 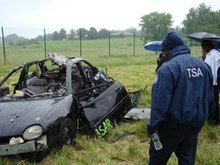 PIRA Chief of Staff Seán Mac Stíofáin defines the car bomb as both a tactical and a strategic guerrilla weapon. Strategically, it disrupts the ability of the enemy government to administer the country, and hits simultaneously at the core of its economic structure by means of massive destruction. From a tactical point of view, it ties down a large number of security forces and troops around the main urban areas of the region in conflict. On June 25, 1996, a truck bomb destroyed the Khobar Towers military complex in Saudi Arabia, killing 19 United States Air Force (USAF) personnel and injuring 372 persons of all nationalities. On 20 April 1999, Eric Harris and Dylan Klebold planned to use two car bombs as the last act of the Columbine High School massacre, apparently to murder first responders. Both failed to explode. On 11 December 2010, (2010 Stockholm bombings) - a car bomb exploded in central Stockholm in Sweden, slightly injuring two bystanders. Twelve minutes later, an Iraqi-born Swedish citizen accidentally detonated six pipe bombs he was carrying, but only one exploded. The bomber was killed but there were no other casualties. It is believed that the attacks were the work of homegrown terrorists who were protesting Sweden's involvement in the war in Afghanistan and the publication in Sweden of cartoons depicting Muhammad. During June 2015, in Ramadi, Iraq, a vehicle-borne IED resulted in the collapse of an 8 story tall building during fighting between the Iraqi military forces and Daesh extremists. The Daesh truck bomb was fired upon by a rocket-propelled grenade which resulted in the explosion. On 21 December 2016, a minibus filled with gas bottles intentionally crashed into the Australian Christian Lobby building entrance. No injuries were incurred, but the building was badly damaged. On 16 October 2017, Maltese journalist and blogger Daphne Caruana Galizia was murdered in a car bomb attack. The Iraqi insurgency. 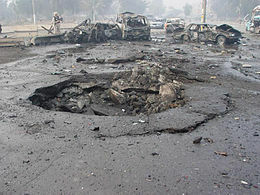 An estimated 578 car bombs were detonated in Iraq between June 2003 and June 2006. Car bombs continue to be commonly used. The Islamic State of Iraq and the Levant, which has employed armored explosive-laden crossovers, full-sized pickup trucks, motorbikes and sport utility vehicles as suicidal tactical units to breach enemy defensive fronts in Syria and Iraq. The use of armored tractors and haul trucks was also recorded over the course of the war. ^ a b "Vehicle Borne IEDs (VBIEDs)". Global Security. Archived from the original on 25 July 2008. Retrieved 3 August 2008. ^ a b c d Wilkinson, Paul; Christop Harman (1993). Technology and terrorism. Routledge. ISBN 0-7146-4552-4. ^ "2015: an epidemic of suicide bombs | AOAV". AOAV. Action on Armed Violence. 10 August 2015. Archived from the original on 21 September 2017. ^ Holly, Williams (March 5, 2017). "Reports of suicide car bombs, possible exposure to chemical weapons in Mosul fight". CBS News. Archived from the original on July 7, 2017. ^ David, Enders. "Car Bombs Have Become the Islamic State's Assault 'Weapon of Choice' | VICE News". VICE News. VICE News. Archived from the original on 2017-09-21. ^ "ISIS video shows suicide bomber in car full of explosives before blast - Daily Mail Online". Archived from the original on 20 December 2016. Retrieved 12 December 2016. ^ "Take a look inside an armoured Islamic State car bomb". ABC News. Archived from the original on 2015-12-03. ^ Davis, chapter 4, "Oranges for Jaffa". ^ "The Atlas Group and Walid Raad - Cornerhouse". Archived from the original on 29 December 2007. Retrieved 12 December 2016. ^ McStiofáin, Seán (1975). Revolutionary in Ireland. G. Cremonesi. p. 243. ^ Car bomb kills Northern Ireland lawyer Archived 2009-09-09 at the Wayback Machine BBC News, 15 March 1999. ^ Taylor, Peter (1999). Loyalists. Bloomsbury Publishing. pp. 125–126. ISBN 0-7475-4519-7. ^ Davis, ch. 13, "Car-Bomb University"
^ Gardham, Duncan; Oscarsson, Marcus; Hutchison, Peter (12 December 2010). "Sweden suicide bomber: Taimur Abdulwahab al-Abdaly was living in Britain". The Daily Telegraph. London. Archived from the original on 21 January 2011. Retrieved 12 December 2010. ^ "Liveleak.com - [Combat edit] New ISIS release - VBIEDs collapse 8-story building - Fighter wearing GoPro gets killed - Ramadi (June, 2015". liveleak.com. Archived from the original on 8 May 2018. Retrieved 8 May 2018. ^ "Daphne Caruana Galizia killed in Bidnija car blast". Times of Malta. 16 October 2017. Archived from the original on 16 October 2017. ^ "200lb of explosives in Derry car bomb". BBC News. Archived from the original on 2010-08-22. ^ Daniel Swift (4 May 2007). "Explosive reading". Review of: Buda’s Wagon: A Brief History of the Car Bomb. Financial Times. Retrieved 6 May 2010. ^ Ellingwood, Ken (21 October 2010). "Mexico arrests man alleged to have directed fatal Juarez car bomb attack". Los Angeles Times. Archived from the original on 8 May 2012. Retrieved 6 May 2012. ^ "Car bomb explosion followed by shootout in Nuevo Laredo". KGBT-TV. 24 April 2012. Archived from the original on 26 April 2012. Retrieved 6 May 2012. ^ "Reafirma El Chapo presencia en Tamaulipas con coche bomba". Blog del Narco (in Spanish). 24 April 2012. Archived from the original on 27 April 2012. Retrieved 6 May 2012. ^ "Suman 23 ejecutados en Nuevo Laredo, entre decapitados y colgados". Proceso (in Spanish). 4 May 2012. Archived from the original on 7 May 2012. Retrieved 6 May 2012.